Nickname Maker - Online real-like name generator. It's cool and free! * After customizing hit the Generate Nickname button again. It's very easy to use this Nickname Generator. I can generate a lot of nicks in seconds, and just use which I like. We generate a completely-, never-used-before word as your Nickname. You are not going to see the same Nickname everywhere else. This free Nickname Generator provides an easy-to-use interface, for everyone. Even on PC, Tablet or Mobile devices. Let others know about your new Nickname, by sharing it on Facebook, or other social websites. Choose whether to generate one or two word as your Nickname. Similar to a Given and Family name together. If you like short Nicknames, just choose a lower number of characters. If you like longer Nicknames, just choose a higher number of characters. You can have even more control of your Nickname, if you type a "begin" or "end" word, into the proper fields. With Nickname generator you can easily generate the best nicknames in seconds! This is an experiment - where you can generate real-like words. The nickname generator generates new words by analyzing all the letter occurrences in thousands of real words. Our nickname generator lets you also customize the generating process with a few options, to make your own nickname. 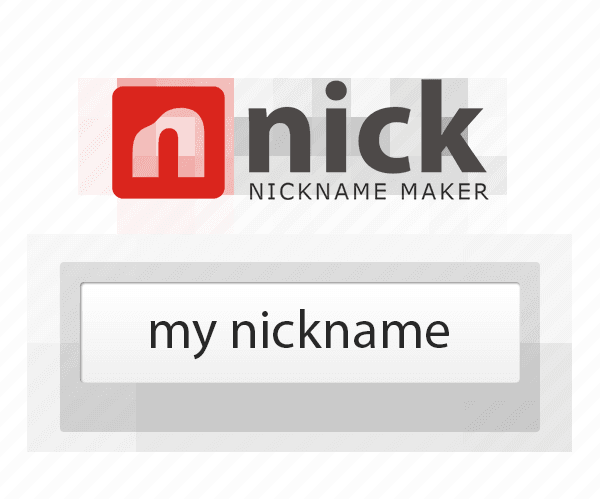 With nickname maker you can create familiar, humorous and simple name to a person. Nickname creator is also good for creating different names for places, houses, villas. A nickname generated with our nickname generator, can be a replacement of real names or too long, boring names also. A nickname creator is similar to a nickname maker, the difference is, that with nickname creator you can create completely new nicknames, and with nickname maker you can make your already imagined nickname by using the options. Note: we have recently reached 7.4 million generated nicknames, and all this thanks to you, dear visitor! Please keep the nickname generator up and running! It is completely FREE to use, or EMBED into your website, however if you like it, don't forget to hit one of the LIKE buttons on the top of this page. Thank you! What is the etymology of nickname?